Lake Bridgeport is a small (11,924 acres, 20 miles long, and 170 miles of shoreline) but pretty lake with rolling tree lined shoreline that is dotted with some very nice homes. The water is relatively clear, there are some great coves and areas for skiing, boarding, or tubing, and the fishing is pretty good. Here are some of the best Lake Bridgeport waterfront cottages, cabins, lodges, vacation rentals, and other good lodging for you to choose from for a fun weekend or longer on Lake Bridgeport. 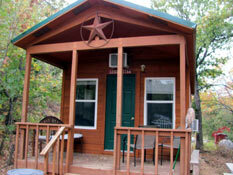 What are you waiting for, pick up the phone and book a weekend or vacation on Lake Bridgeport. 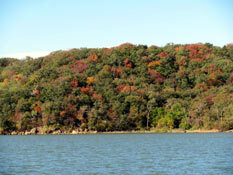 North Side Marina & Resort sits on a bluff overlooking a small protected cove on the northwest side of beautiful Lake Bridgeport. 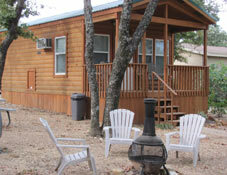 They offer a variety of vacation lodging from one bedroom one bath cabins to a double wide trailer with four bedrooms and three bathrooms that will sleep 14 to 20 of your friends or family. All of the lodging has bathrooms with showers, TVs with DVDs and satellite, WiFi, full kitchens, mini to full refrigerators, linens, and all the utensils you'll need to cook a good fish dinner. The patios have grills, picnic tables, and fire pits - perfect for a campfire after a scrumptious meal under the stars. 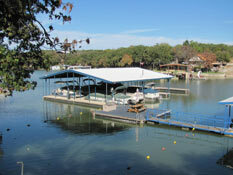 All of the lodging has lake views from their patios. Some of the other amenities at North Side Marina & Resort include: 7 full hook-up RV sites; a private boat ramp and ample trailer parking; playground; recreation hall with a pool table, shuffleboard, fooseball, and air hockey; a ships store with a little bit of everything including bait, ice, drinks, and staples; a marina with gas, boat slips, and overnight guest boat slips; pontoon boat, paddle boat, and kayak rentals; and a roped off swimming area.